It ran an online poll from February 23 to March 4, where Starbucks fan can vote which side they are on. Team Roasted Caramel or Team Chocolate Hazelnut? The poll ended Friday, March 4, and announced a day after, a unanimous decision was made. All regions, Luzon, Visayas and Mindanao went for Team Chocolate Hazelnut. Now, time to enjoy the Starbucks Buy One, Get One Promo this March 7, Monday, as you share the other one or gulp it too in one sitting. 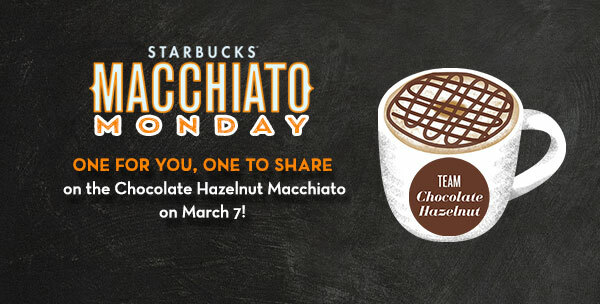 As per http://www.starbuckspromotions.ph/mechanics, though this Promo is only good for a day(March 7, Monday), there's no limit on how many paid Chocolate Hazelnut Macchiato you can order in just one transaction. Tall, Grande or Venti -sized Chocolate Hazelnut Macchiato can be availed with the Buy One Get One Starbucks Promo. Use your Starbucks card to pay for your Chocolate Hazelnut Macchiato to claim your Starbucks beverage star. A beverage star can be earned for every paid Chocolate Hazelnut Macchiato beverage using your Starbucks card.